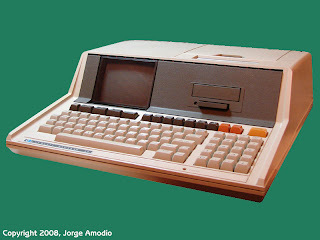 The Series 80 Personal Computer product line was introduced by Hewlett-Packard in 1980 with the HP-85 model which was one of the earliest integral desktop computers that in the same cabinet included the main computer, a printer and a tape drive. Over the product line life span HP developed several models. 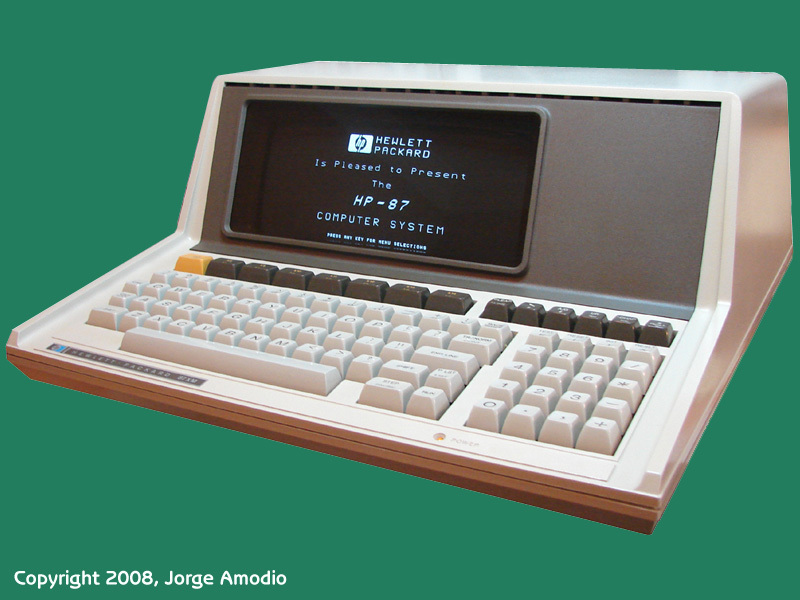 The early and original HP-85 with 16KByte RAM and 32KByte System ROM was known as the HP-85A and was introduced in January 1980. 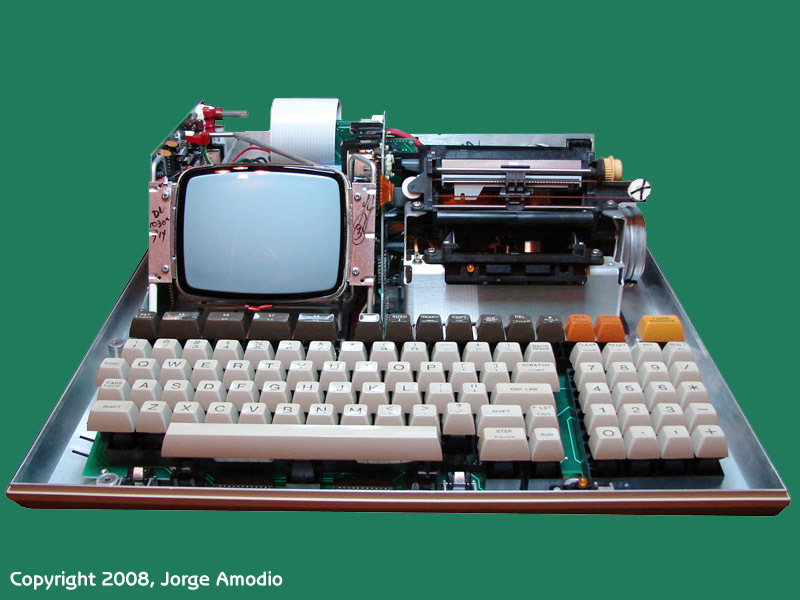 At that time I was already doing programming in BASIC and APL on the IBM 5100 and IBM 5110 computers, they had almost the same form factor as the HP-85, small CRT screen on the left, tape unit on the right and a full size keyboard and ROM resident BASIC interpreter. 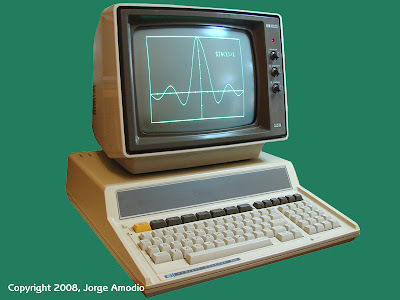 The IBM computers had a decent version of BASIC for financial and office type applications, one of my early projects consisted in developing a payroll system to manage payroll for the teachers in my school. But the IBM stuff was pretty expensive and heavy, nothing that you can consider close to "portable", but the HP-85 was my favorite, much nicer design, cheaper and more oriented for engineering and scientific applications. 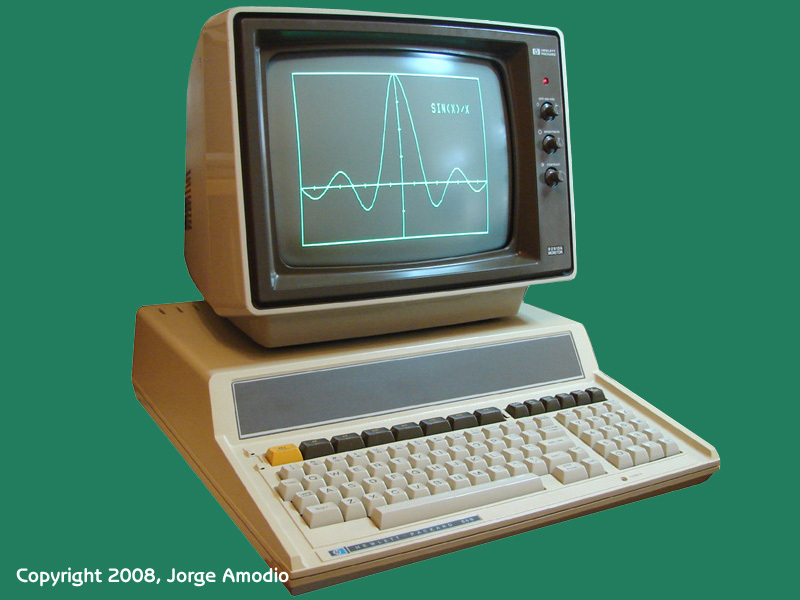 The HP-85 was the preferred choice as a controller for automated measurements, I still use one in my lab to control a bunch of HP-IB capable instruments. One interesting characteristic of the HP Series 80 was that its architecture was not based on any of the available microprocessors at that time, instead HP developed a set of specific custom large scale integrated (LSI) circuits for the HP-85 which let them reduce the number of external components and power dissipation enabling the use of air convection instead of the noisy fans for cooling. Even for an 8-bit CPU (code named "Capricorn") running at a 614KHz the performance was very good, since the CPU was designed to use a multiplexed data and address bus optimized for multibyte transfers (frequently used by BASIC interpreter tokens and numeric values) and minimizing the need to constantly send addressing information for each read/write operation. There are many publications and great sites available today with plenty of information about the HP-85 and the rest of the HP Series 80 family. There is a list of links at the bottom if this article. Also the entire July 1980 issue of the HP Journal was dedicated to the HP-85 and in the August 1980 issue you can find an article from Todd Lynch about the LSI chips used in the HP-85, and courtesy of Eric Smith here is a copy of the patent application that Todd and HP filed for the Capricorn CPU. As I mentioned before, the HP-85 was one of my favorite machines, and there are many still in use and in good operating condition, but some of the accessories are very hard to find. For example I don't have some of the original expansion ROMs such as Assembler, Mass Storage, etc. I've been looking around for a while for a HP 82929A Programmable ROM Drawer to be able to use some EPROMs with the images of the missing ROMs, but with no luck yet. On the other hand over the past few years I've been doing microcontroller based designs, then I decided to start some projects to get more juice (lets be frank, and also for fun) from the HP-85 and emulate some expansion modules and external interfaces using microcontrollers (if you know well the HP-85 architecture you must know that most of the external interfaces had an Intel 8049 microcontroller doing the job). My first project on the list was to find/obtain/steal/replicate/materialize a HP 82929A Programmable ROM Drawer. I know that some folks have done it in the past but I didn't find much information available on-line. Some time ago Bill Kotaska with support from John Shadbolt developed the PRM-85 as a replacement board for the HP 82929A. I tried to contact Bill but with no luck, but John was fast to reply to my request for information, without his help this first project would have been almost impossible to complete. I also need to mention Everett Kaser who while at HP was involved somehow in the HP-85 development and is the author of one of the HP-85 emulators for Windows, provided great information and a lot of insight and encouragement, and Tony Duell, that if you you have ever read some forums/mailing lists about classic computing or retro computing you probably know that he has always something to say and interesting information to share, and Vassilis Prevelakis and the HP Computer Museum folks for making such a vast collection of manuals and information available on-line. As time permits I'll be adding to this blog additional information, and status of various HP Series 80 related projects. This brings back a lot of memories on dealing with the old series 80. How HP printers evolve over time amazes me. © 2018 Jorge Amodio. All Rights Reserved. Picture Window theme. Theme images by bopshops. Powered by Blogger.